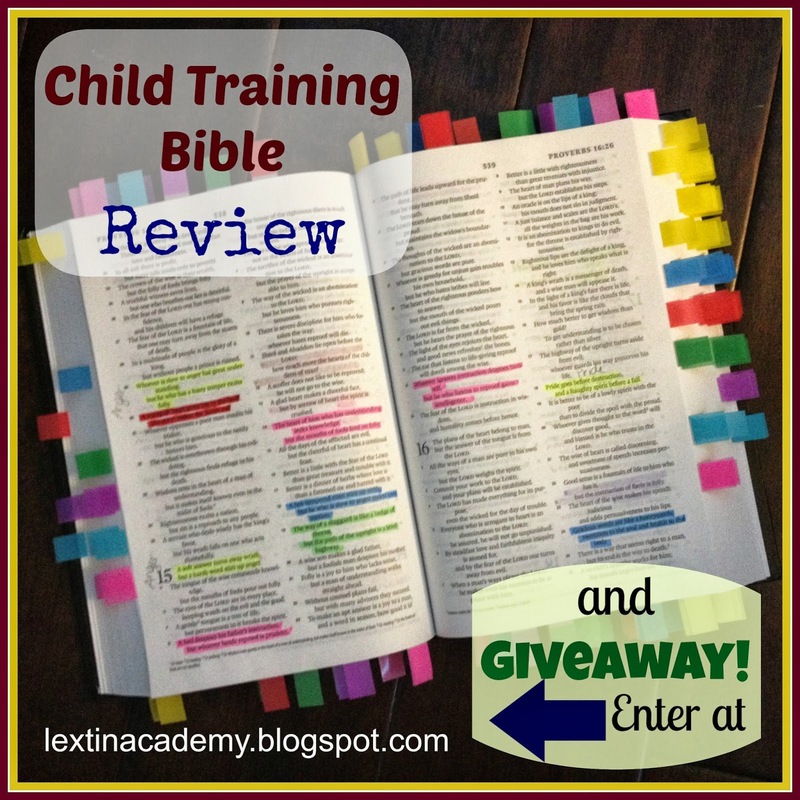 I had the chance to review the Child Training Bible with my family. (And I’m even hosting a giveaway at the bottom of this post so make sure to scroll all the way to the bottom!) But I’m excited to share how this Bible has changed our discipline approach and is making an impact on reaching the hearts of our kids for Christ. The Child Training Bible was created by Mindy Dunn, a homeschool mom of 4 who wanted to use Scripture in training her children. She had used index cards and charts with verses on them but found it essential that the children see her paging through the Bible and showing them the verses in the Bible. They needed to see the verses as part of God’s Word. Mindy created a chart of verses arranged by topics such as disobedience, fear, jealousy, quarreling, tattling, complaining, and defiance. These topics are color coded. 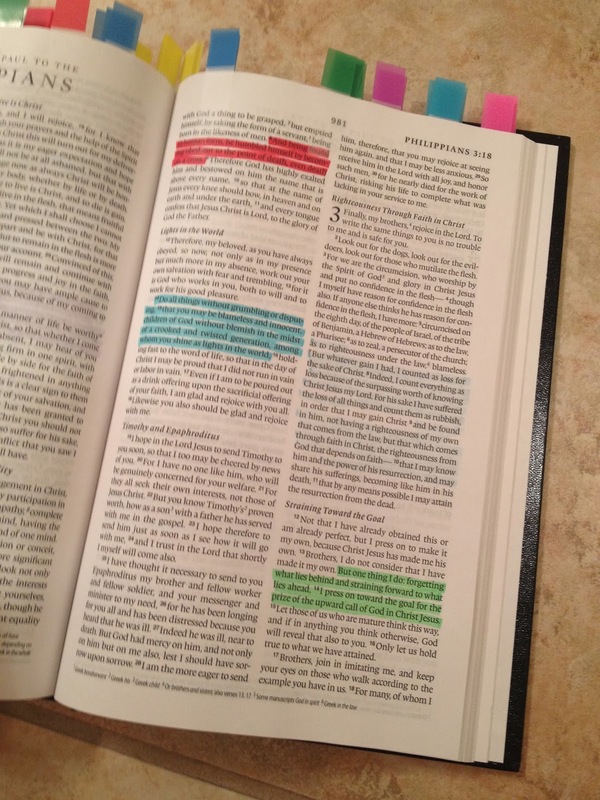 Using the charts with the Scripture references, you can then go through your Bible and highlight each of the references with that color highlighter and then place a colored sticky tab at the edge of the page. This allows you a quick reference of verses to address various character and obedience issues by selecting the topic and using the color coding to help you find the verse quickly. You can purchase the charts for $9 and will need to purchase the other supplies (a Bible, a set of highlighters, and colored sticky tabs) separately. 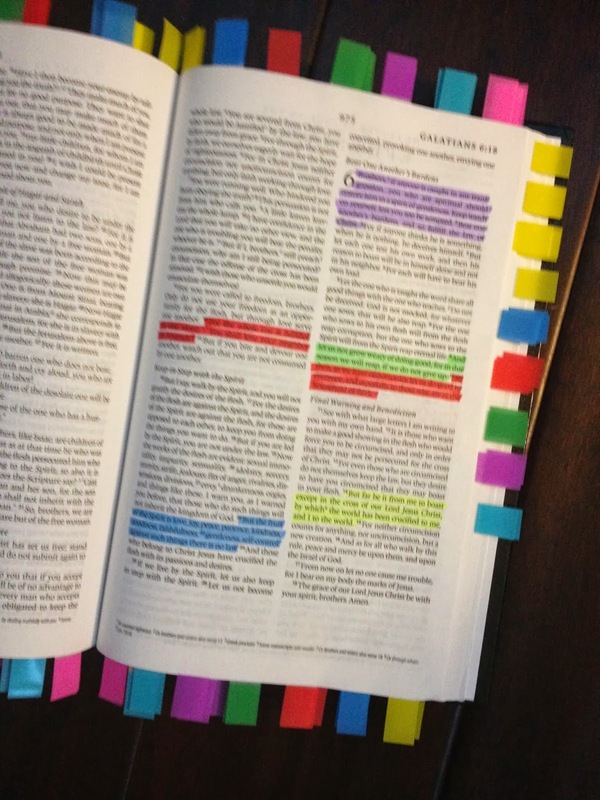 You can also contact Mindy if you would like a completed Child Training Bible with highlighting done and sticky tabs placed. You will have to provide your own Bible, highlighters, and colored tabs. However, the charts that come with the Child Training Bible provide more than just a list of references. First there is the Instruction Card. (I recommend reading that right away and not waiting until you’ve already begun your project – like me!) It has helpful hints for placing the tabs – such as placing them all on the right hand side of the Bible regardless of where the verse is located. This makes it easier to flip open to that page. It also suggests to write down the discipline issue next to some of the verses in the event that you have multiple verses highlighted with the same color on one page. And this will happen! Because the colors are used for more than one discipline issue, there are a few pages that have the same color but for difference discipline issues. The main card has a color-coded key for each discipline issue. 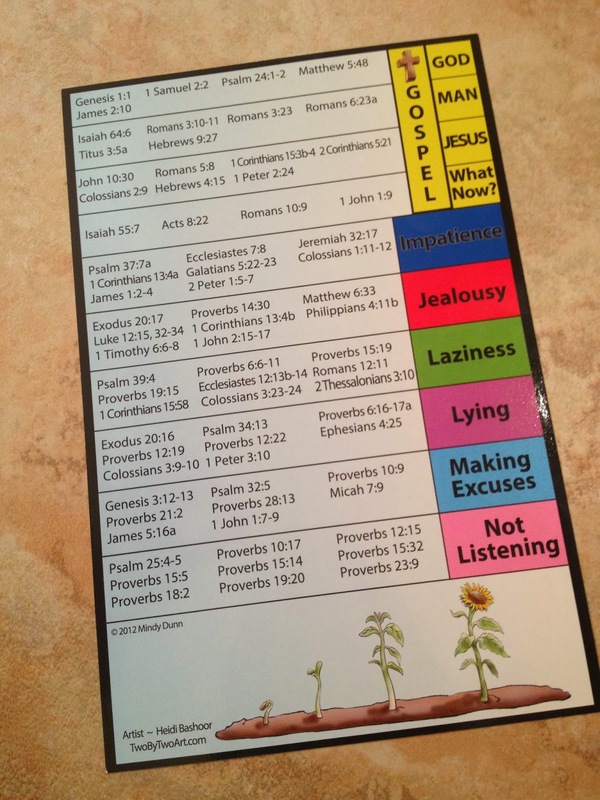 This card is placed on the first page of the Bible so you have a quick reference for placement of each tab. The other 3 cards contain the Bible verse references. On the back of each card is a set of questions that correspond to each discipline issue. The first set of questions are for you to ask your child to help reach their heart and uncover the root of the issue. 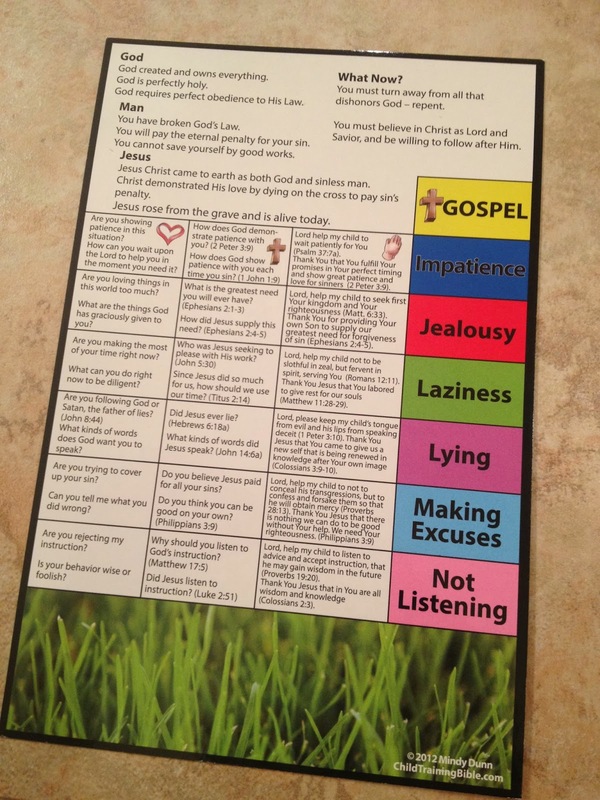 There are questions such as: “Did you have a godly response to this situation?” or “Are you trusting God right now?” The next section of the card has questions to point your child to the Gospel. They are questions about Jesus and how He handled some of these very same issues. Some of the questions were: “Do you believe Jesus paid for all your sin?” and “Did Jesus listen to instruction?” The last section of the back of the cards has a prayer to pray with your child. I ordered a plain black ESV Bible, colored highlighters, and sticky tabs. Once my charts arrived I set to work creating our own Child Training Bible. 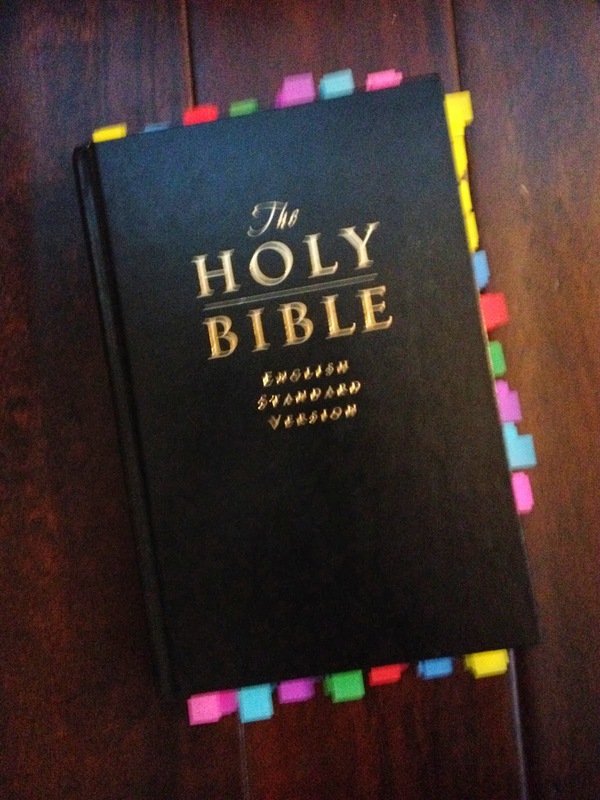 I will admit that I was not looking forward to the work of finding each verse, highlighting it in the correct color, and then placing the tabs around the top, side, or bottom of the Bible. But I found I really enjoyed the process as I read through each references. Some of the verses were old favorites and ones that I had memorized years ago but had forgotten the reference while others were new to me. Over a period of 3 days, I slowly worked on my Bible. 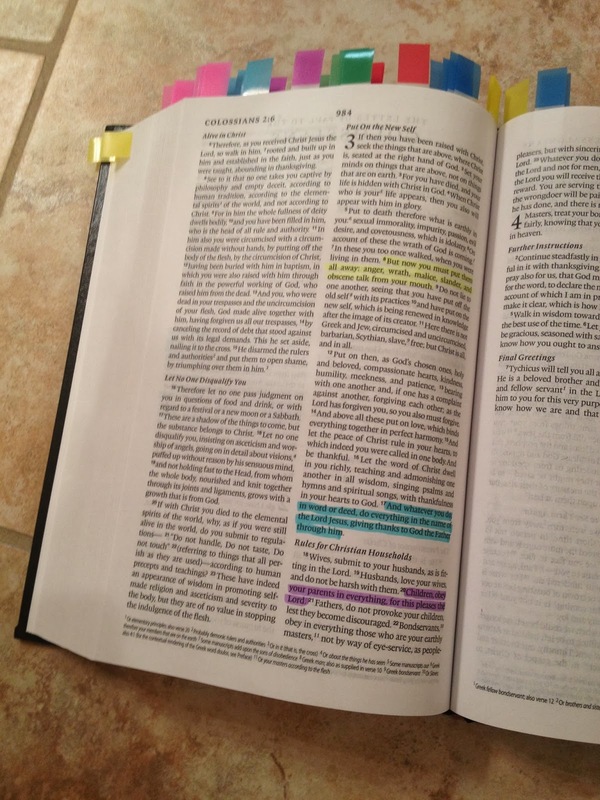 I had my first opportunity to use my Bible before I had even completed highlighting and tabbing each section. Our oldest, Curly (age 7), was having a very rough morning and had been throwing a tantrum over every. little. thing. She was exploding in anger time and time again. After she had some time to cool off in her room I grabbed my Child Training Bible and headed up the stairs. Thankfully I had completed the sections about anger, defiance, and disobedience. Perfect!!! Before I tell you how our little chat went, let me tell you how they usually go. I’m sure you can relate. You try to talk to the child who was only moments before completely hysterical. They are calm for a short time before they start another round of screaming. You so want to reach their hearts and help them see their sinfulness and God’s grace. However, you are completely exhausted and at a loss for words. The only thing you can get out is some sort of punishment or threat. I bet we’ve all been there! Then you walk away feeling discouraged and defeated because you had wanted to share your heart and point them toward God’s heart and the only thing you managed to do was upset your child and yourself even more. That is how many a conversation has gone at my house before. But that’s not what we want – it’s not what we’re aiming for. No, we want to reach our children’s hearts and help them discover God’s truths on their own. And that’s exactly why I was so thankful that I had already begun putting my Bible together. I opened the Bible to the first verse on anger and we worked through every verse in that section and several verses in the disobedience and defiance sections. I read the verse and then I explained the meaning. Curly asked questions and after we had read the verses she opened her heart to me and poured out her frustration (in a calm and tearful way). At that point I was able to pray with her and share some things that I thought would help her. Then we talked about positive ways to respond next time she was feeling angry and frustrated. It was the most sweet and touching little chat! And it was nothing I did – it was because I took her straight to the ultimate authority, God’s Word. She was already upset with me and would not have listened to me, but she could not ignore the verses that I read with her. Hearing the words from the Bible opened her heart and we were able to work through her anger. After our talk she came downstairs and rejoined our school day. She had such a changed spirit! Now I keep our Bible on the bar in our kitchen so I can grab it any time we have a discipline issue. I’ve also taught Curly how to use the color tabs to find verses. They make wonderful copywork assignments for our homeschool day as well!! I have loved having this resource sitting on my counter. Like the author, I’ve tried various memory verse tactics and have tried charts and post-its of verses throughout the house. Nothing was ever consistent and my children did not get in the habit of sitting down and opening the Word to see what it said to them. This has been the perfect resource to help me as I strive to reach their heart. And one of my favorite aspects are the questions and prayers listed on the back of each card. Asking these questions has helped guide our discussions and helped my children identify their behavior and recognize their sinfulness. We are all in the habit of turning to God’s Word for answers first! I hope they carry that habit with them into adulthood! So, not only will you be sharing verses that caution your children against sin, but you will read verses that are full of hope and of God’s promises – verses that will put them on the path to good decision-making and teach them to trust the Lord. And while the Bible is somewhat time-consuming to put together, I enjoyed my time familiarizing myself with the verses that were chosen. Time in God’s Word is never wasted time! The Gospel tab also has verses to lead me through a presentation of the plan of salvation. I can’t wait to read through these verses with them time and time again as I pray for their hearts to be open to the Lord for salvation. I’m so thankful for the Child Training Bible and for the way it has already allowed me to guide my children’s heart and gently turn them toward God’s Word. This is a keeper in our house! And I think I might need the Virtue Training Bible next! 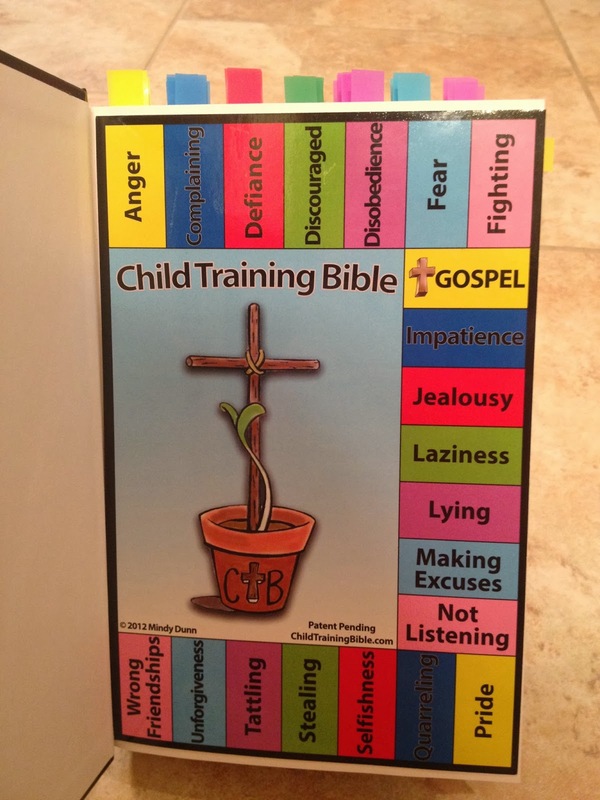 You can also follow both the Child Training Bible and the Virtue Training Bible on Facebook. Disclaimer: I received a free copy of this product in exchange for an honest review. I was not required to write a positive review nor was I compensated in any other way. All opinions are mine. And enter the giveaway to win a set of Child Training Bible cards so you can create your own Bible! Prov 15:1, A soft answer turneth away wrath. Children, obey your parents. . .